Unbeknownst to most people, there is an expansion plan in the works to increase the size of the Eagle County Regional Airport. The estimated cost of the construction is $45 million and, frankly, is a waste of public funds. This project contemplates the addition of a second floor to the current terminal building and the addition of space to park up to eight 757 aircraft at one time. The plan calls for an expansion of the hold area from the current 35 feet width to 55 feet. It calls for a demolition of the current holding area over the next two years. Why would the airport spend $45 million on a facility expansion when the Eagle County Regional Airport has seen a 32 percent decrease in passenger traffic during the past eight years? Further, the concept contemplates building an area for eight 757 aircraft that, within a few short years, will be taken offline by the airlines and replaced by smaller Airbus planes that provide improved navigational technology and are more fuel efficient. I first heard of the expansion idea in 2012 when Greg Phillips, the airport manager, was hired. Mr. Phillips did not have any detailed plans at that time but felt the terminal needed an expansion because of crowding on 16 Saturdays during the winter season. 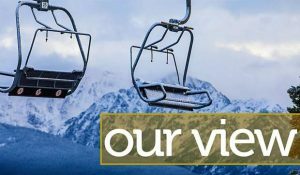 At that time — and now — I believe the priority should be on increasing passenger traffic to the Eagle County Regional Airport to benefit the resort communities, locals, airlines serving the airport and tenants at the airport. In fact, since 2007, Eagle County Regional Airport enplanements (passengers) have decreased almost 75,000. The busiest year for the airport, 2007, saw 230,350 passengers boarding the commercial airlines. In 2015, there were 156,876 passengers boarding the commercial carriers — a 31.8 percent decrease. During the eight-year period from 2007 to 2015, there has been only one year (2011) with a slight increase in traffic. This year, 2016, has seen an increase of only 2.2 percent, or 2,700 passengers. There are numerous reasons for the decrease in passenger traffic at the Eagle County Regional Airport. The EGE Air Alliance is doing their best to get traction in the community to improve the volume. The Alliance has more work to be done. In my opinion, the terminal expansion decision is an example of “a bridge to nowhere,” wasting public funds and increasing the debt on the airport. This concept is a non-strategic and a poor business decision. The bottom line is that it is a waste of money. Rather than expanding the Eagle County terminal, why don’t we reduce the costs for airlines to do business with us? Locals and our guests weigh the comparable costs of flying out of EGE vs. DIA. Parking costs now figure greatly into that decision. I recommend that the county do away with paid parking, reduce the cost to companies doing business at the airport so that they could be more competitive, make do with available resources and avoid leaving the county and our community with a financial albatross around our neck. I recommend a thorough review by our county leaders before spending this kind of money. Kent Myers is the principal of Airplanners LLC, a consulting group providing airline strategy to resort communities and municipalities throughout North America.